Guilt-Free Indulgence With Only 190 Calories! NEW, from the makers of America’s #1 Selling Weight Loss Supplement Brand comes guilt-free, indulgent satisfaction. 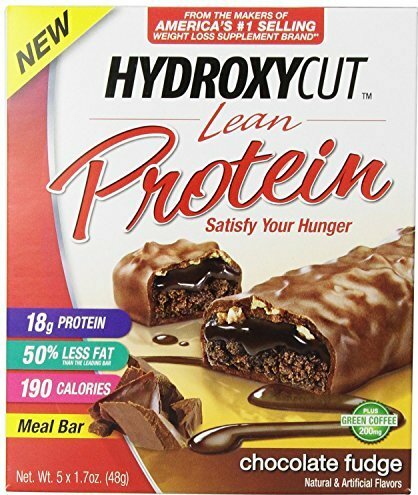 Hydroxycut Lean Protein Bars are far from your average protein bar. Each serving packs a whopping 18g of protein and contains only 2g of sugar and only 4g net carbs! Plus, you get 200mg of green coffee extract with every mouth-watering serving. Don't Deprive Yourself – Indulge! Enjoy a healthy lifestyle while having guilt-free indulgences along the way. Enjoy the rich, delectable taste of Hydroxycut Lean Protein Bars and get the protein you want in a satisfying and delicious guilt-free indulgence. Great tasting bars with lean protein. With 190 calories to help satisfy your hunger, try one today!